The Paradise Manor landscape plan includes a series of inviting gardens and play areas for this 22-acre, affordable housing complex. 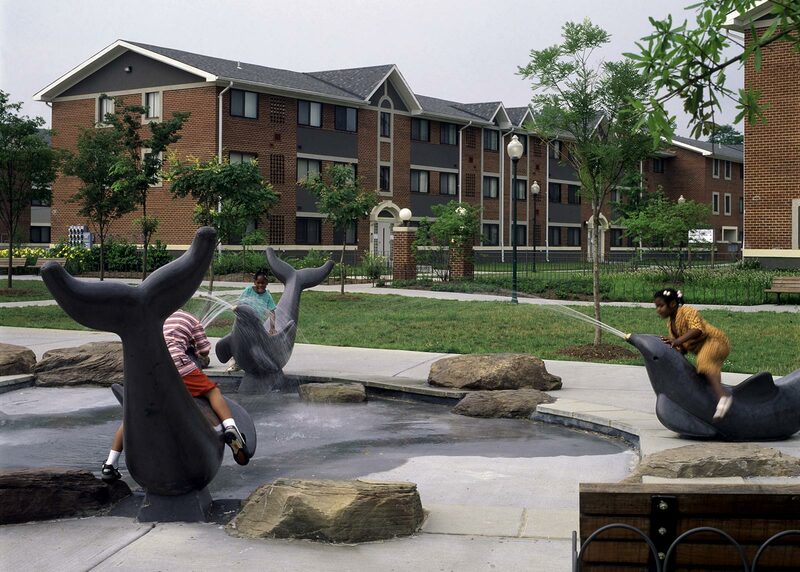 A whimsical outdoor court and fountain were installed as a centerpiece for the community. The design unified the once disparate building blocks of the neighborhood, linking them in a series of expressive green spaces that offer residents a renewed sense of place and outlets for outdoor recreation. The pedestrian circulation system was rerouted into a continuous, central promenade that connects playgrounds, recreational areas, and landscaped courtyards nestled among the buildings. Ornamental fencing, benches, and decoratively detailed walkways integrate the complex into the surrounding urban context. Paradise Manor has since become a longstanding model of success for the city and the community.